Wild Woods Tree Adventures was an activity decided on by 4 of our family members (2 mothers and their daughters) visiting us in Sedgefield over the Christmas holidays. 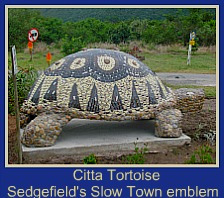 Situated at Timberlake Organic Village just off the N2 between Sedgefield and Wilderness, it is just one of many reasons to stop off at this environmentally conscious lifestyle centre. While I took photos of their experience (on two different cameras!) 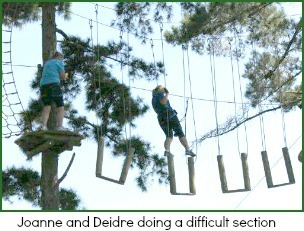 the girls gamely clambered up amongst the treetops along a circuitous route over sections involving varying degrees of difficulty. 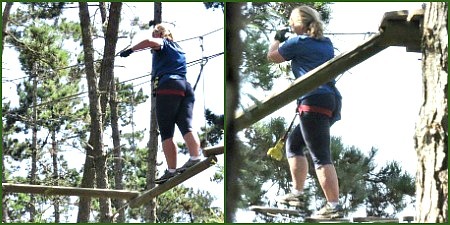 The course took +/-2 hours 30 minutes to complete. 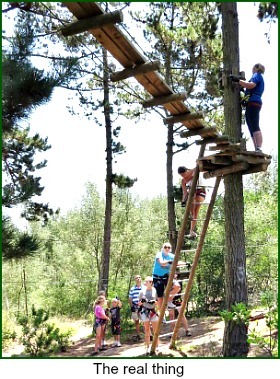 It looked like a fun way for a group to get active and challenge themselves by trying out this off-the-ground obstacle course. It is clearly also a good team-building exercise. Part of a larger group, the girls and other participants were given a few basic instructions and then did a short a trial run to see that everyone understood what to do and how to observe the safety requirements and then they were good to go.....over 3.8 kms of cabling that they were attached to at all times while swinging, balancing, crawling, scaling rope bridges, walking or zip-lining between some 74 aerial platforms! There are 2 courses for children up to 12 years old and 3 courses for adults. As long as one is reasonably healthy and agile, can bend and stretch, has some measure of upper body strength and is not afraid of heights, one can do the course. 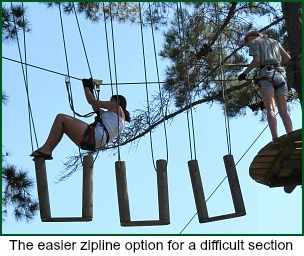 Some stages of the tree adventures that are more demanding, provide an easier alternative option if one feels really intimidated and not up to the challenge for whatever reason. There is plenty to do whilst waiting if some family members don’t want to do the Wild Woods Tree Adventures. There’s a quad-biking trail through the pine forest. Specially for the kids, there’s Adventure Land and a Fairy Garden walk to enjoy. Tuesdays to Sundays the Express Barrel train departs from the station next to the Adventure Castle. Children’s art classes are available if booked in advance. 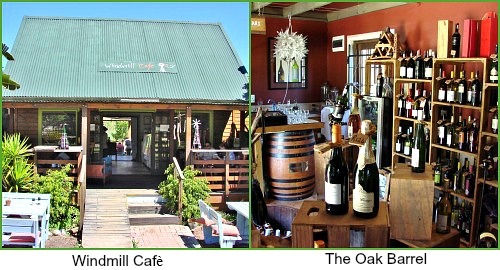 There’s the Windmill Cafè offering a picnic style menu with all locally grown produce and products. The larger Zucchini country style restaurant serves equally healthy and tasty fare. A delicious assortment of locally caught seafood is offered finger-food style at the tapas bar called the Oyster Shack. Popular local products such fresh breads, tarts and biscuits can be purchased at the Country Deli and a variety of local cheeses at the Cheese Head. The Oak Barrel is licensed to be open 7 days a week and provides a good selection of wines to choose from. The stall, Made Local showcases home-made goods and crafts from the area. 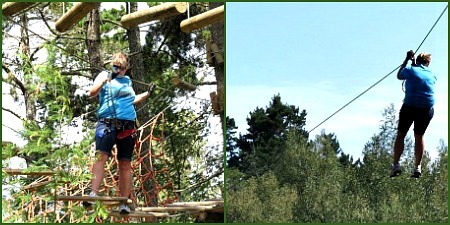 Experience the majestic forests of the Garden Route National Park like never before with a trip to Acrobranch. 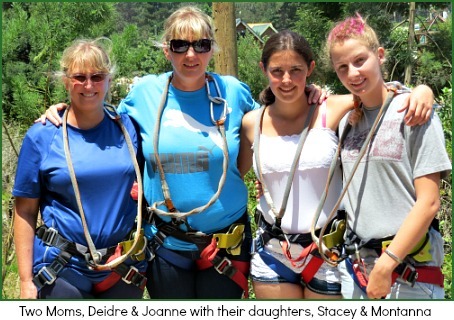 Only a short drive from Knysna, George and Plettenberg Bay, Acrobranch has become a well-loved outdoor adventure that attracts tourists and locals alike. Located in the Timberlake Organic Village, guests will enjoy the jaw-dropping beauty of the forests, lakes and mountains that surround the park. 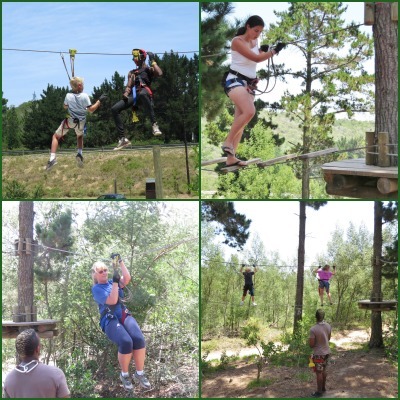 Slide, balance, jump, crawl or swing through the action packed courses.